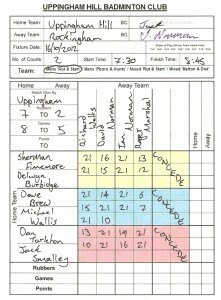 The Rutland and Stamford Mens team took to the courts with confidence high after their last outing against Stamford. They faced a weakened Rockingham side, who sadly arrived minus a last minute member. Rockingham decided to play with the two pairs after Uppingham offered to ‘lend’ them a player for the night, and put up a very strong fight, only going down 4 – 2 on the night. Its always great to see the gents from Rockingham, as they play in the right spirit and are fun to have around. Congratulations to Jack and his team for sticking to their task and coming away with another great win. It was good to see Michael back on the courts and strutting his stuff. Sherman and Delwyn continued their winning ways, picking up their two. Keep up the momentum gents, well played.